Cayenne pepper is a red pepper that is relatively tasteless but medium to very hot. It has a sharp heat and is often used in making Cajun hot sauce. It can be used in a variety of dishes and on its own as a condiment. It is also used in fasts, as it is believed to have a detoxifying effect on the body without having calories. A small red pepper grown on plants or bushes. It is usually ground for use as a spice and is also red when ground. Choosing: If buying a plant, look for plants with healthy leaves and many flowers or peppers. If buying the pepper alone, look for peppers without spots on them. If buying the sauce, be sure to check the expiration date. Buying: Cayenne peppers can be purchased as a plant, on their own or in a sauce or powdered spice. They are also available as a spice already added to savory foods and snacks or occasionally in chocolate. Because of its versatility, buying depends upon how you wish the pepper to be served. Always look for freshness. Procuring: The plant is a hot weather plant and can also be grown indoors though it prefers sun. Water regularly and fertilize when needed. If buying the peppers, they can be ground with a mortar and pestle or chopped finely. Typically, people either buy the spice or the sauce. Use sparingly in dishes as a little gives quite a bit of heat. The sauce can be used as a condiment. Cleaning: Wash the peppers as any fruit. Use soap is you believe pesticides were used in its raising. The spice powder has a relatively lond shelf life and can be stored in a dry, cool, dark space. The sauce can be left out or stored in the refrigerator when not in use. Foods and dishes with cayenne pepper should be stored as any dish should of its type (i.e., a casserole should be kept in the refrigerator if there are left overs). Cayenne pepper does not act as a preservative. 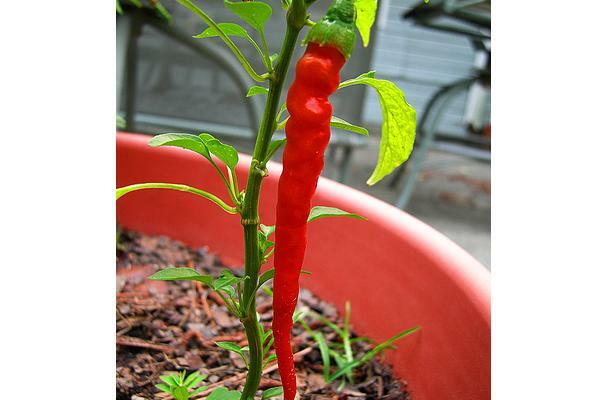 Cayenne pepper is a plant grown mostly in warm wrather regions. It is prevalent in the United States South and in Louisiana in particular. Origin often Southern U.S.